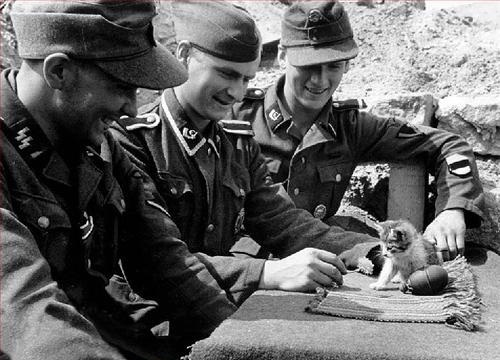 Blitzkrieg can vait; it is time to pet ze kitty! This term was coined by screenwriters, basically meaning: show the nasty old crank petting a dog, and you show the audience, aw shucks, they're not that bad of a person after all. Often used to demonstrate that a Jerkass is really a Jerk with a Heart of Gold, or, if more limited, that the character is goal oriented rather than sadistic and/or thoroughly evil. If used as an Establishing Character Moment then you skip right past the jerkass phase. Of course, this doesn't mean specifically petting a cute animal. It's just any attempt to soften the edge of a villain (or Anti-Hero) by showing him engaging in a moment of kindness, especially towards someone who can't do anything for them. Sub Tropes include Even Bad Men Love Their Mamas, Morality Pet (a character's entire relationship with a villain is one long Pet the Dog moment), and Androcles' Lion (where the dog would later reward the one who petted him/her). Compare Licked by the Dog. A few ways to pet the dog include being an Anonymous Benefactor, I Was Just Passing Through, and Even Evil Has Standards. Demonstrating Moral Myopia could also work (if the people they favor aren't evil). Contrast Kick the Dog (doing something evil to establish an evil personality, with many, many villains having both), Photo Op with the Dog (where it's all an act for the good publicity) Must Make Amends (when a character tries to undo or atone for having Shot The Dog), Bait the Dog (when this is darkly subverted). In modern Hollywood circles, this is also referred to as "save the cat", with the idea being that if you show your hero stopping to save a cat stuck in a tree as his Establishing Character Moment, you're putting the audience on his side forever. The Fabulous Moolah doesn't have a flowery reputation, in or out of the ring, publicly or behind the scenes. She was thought to be rotten and told anyone who would listen her main motivation was money. So her jobbing to give Panther Girl Anne Casey the USA Women's Title belt, Anne Casey who earlier that year had been shot multiple times and was thought to be out of wrestling permanently as a result, it was definitely a case of this. When he was not tearing people's faces open with his teeth or stealing masks, Perro Aguayo Jr. could often be found playing with dogs. CM Punk voluntarily excused Colt Cabana from their Ring of Honor Tag Team title defense at Survival Of The Fittest, voluntarily taking on The Outkast Killaz, The Ringcrew Express and Special K by himself so that Cabana would have a better shot at winning the titular "Survival Of The Fittest'' tournament. Before this, Punk would become visibly angry with Cabana's silliness and Colt at times seemed to follow him more out of fear than friendship, so it was nice to see Punk really did care for him on some level. Shigeo Okumura is best known for his campaigns against Mexican luchadors in CMLL, but since he speaks Spanish quite well, the promotion keeps him around despite the trouble he causes to serve as a translator to the NJPW, REINA and other Japanese talents, which he does faithfully, even for baby faces like Syuri who aren't on board with his "Anti-Mexico" agenda. Lo Zoo Di 105: Santina, the victim of the famous "Alan In Love" prank call, has been found out to be not particularly wealthy. So the show's crew unanimously agreed to reward her patience with them by donating some money to her.